Happy Wednesday! The middle of the week already, how great is that? I am very happy to show you another layout today. This is a very simple layout with minimal embellishments, but I love it. I especially love the photographs which were taken at a local garden (I wrote about our visit to the garden here). I put this layout together at the same time as I was completing this one. 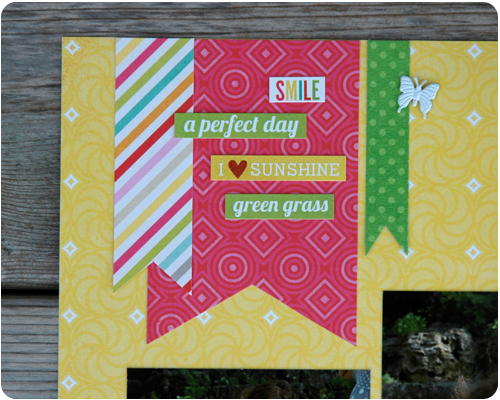 Using the same papers and embellishments (Summer Bliss by Echo Park) I had both pages laid out on my table and just moved between them, adding tidbits to each page as I was inspired, until they were both done. I love this cluster of patterned paper and descriptive words in the corner. Did you notice that there is no title on this page? This is something that I have noticed in scrapbooking lately...many layouts out and around do not have a dominating title, in fact they don't even have a title at all. I love this as an option when creating a layout. Add a title or not, it is really okay either way. 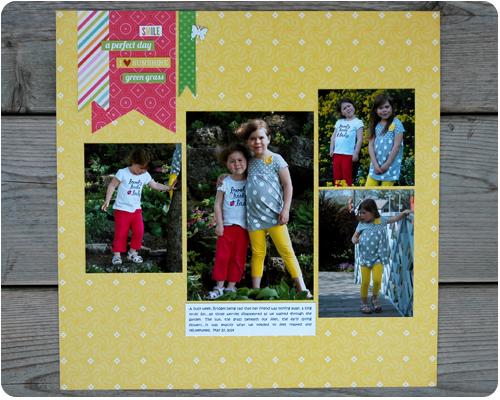 Kind of a reminder that there is no strict recipe for a scrapbook layout....just do what you love. As always, thanks for stopping by and happy crafting. Love this adorable layout! Love how the colors match their outfits!! So sweet!! Love your clean/simple yet whimsical style! you prove you don't have to add too much "stuff" to make a cute layout! I'm trying to be more like that. I'm following you now and looking forward to much more inspiration! Thank you Doreen. I really appreciate your comment as I sometimes worry that my style is too simple, especially when I see other layouts that are just loaded with stuff. Happy to have you following along.